Can the dynamic rookie duo for the Colts + Capt. Luck stop Kermit? Will the Rams show up ready to play this year or will Dak and Gruden's Gift step up? Can Philip Rivers finally beat Tom Brady? Is the Dynasty finally over? Will the Ballad of Nick Foles come crashing back down to earth against Peyton, Brees and Lattimore? All fine, fine stories for the last true weekend of football, until all the Spring leagues start their inaugural seasons in a couple of months. Those are sure to be real fun to watch. (Injured) Antonio Brown is replaced by JuJu Smith-Schuster in the Pro Bowl. So meta! “I like it here and I like it here a lot, and everybody around here knows that I like it here,’’ said Kitchens. “I love the town of Cleveland. Cleveland and I get along well. DT Kyle Williams retired after 13 long seasons with the Bills. His career may be over, but he's suiting up for one more NFL game as he's been promoted to the active roster for the Pro Bowl. I won't watch the "game," and neither will you, but it's a nice story nonetheless. Hated the fade route play call. Hated the field goal attempt. Colts played conservative and still walked away with nothing to show for it. Congrats Jay. Hope you guys win it all. Seeing reports/rumors that Jason Kelce is gonna retire after this season. He's only 31. Huge loss for Eagles if it comes to pass. Dirty secret on the Cowboys is thay Zeke hasn't been very good this year despite the way the numbers look. Jason Garrett being aggressive?!? Holy hell, it froze over! This is in LA, right? I didn't know Pizza Hut hauled Daniel Day Lewis out of retirement. Did someone say Daniel Day Lewis? Refs really f*cked up on that 3rd down blowing it dead for no reason. Jags: "How can we make the smallest possible upgrade at QB next year?" Jaguars, Joe Flacco have mutual interest. Two interesting games last night, but not thrilling or unpredictable. Except maybe for the Chiefs D. They made the Colts look pretty bad last night. Today? Probably more of the same. If we're allowed only one shocker this weekend, I hope it comes in the late game. No thank you. Early game upset please! Yeah let’s get two road wins today!! If we're allowed only one shocker this weekend, I hope it comes in the late game. You make an excellent point and I think that we should all agree. TBH, though, a Chargers victory would be extremely pleasing, but probably not a shocker. 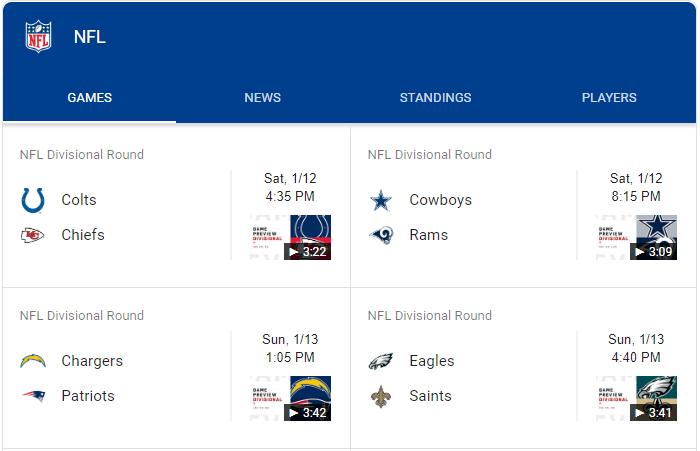 On the other hand (now that Dallas is out), after the worst possible SB matchup (Patriots vs anyone), the next worst would be LA v "LA". Personally, I think that'd be pretty rad, just from a ridiculousness point of view. The actual game would probably be pretty crap though. With Watkins back and healthy after a great game last night, I'm so much more confident that the Chiefs will beat whoever comes to Arrowhead next week. 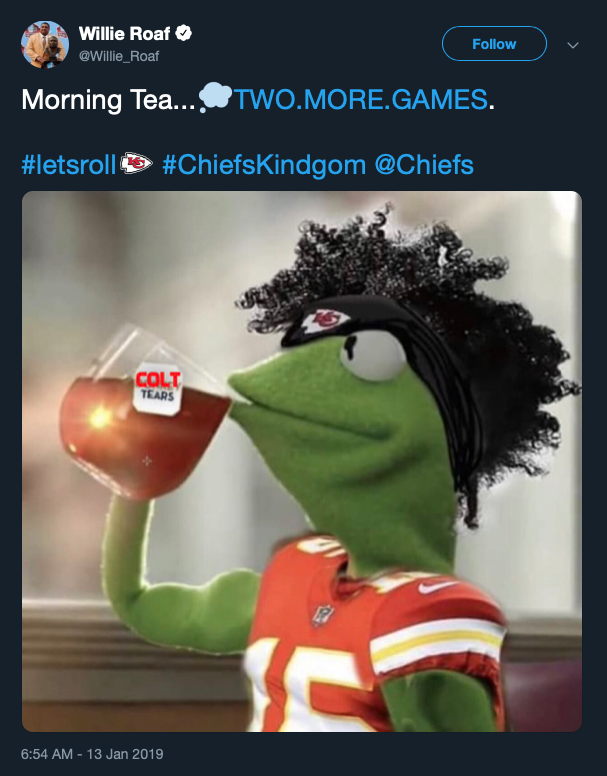 Chiefs Kingdom is feeling pretty good today. Could he have used a different verb for the "Bathroom crowd?" I wanted to be right, but I didn't want to be this right. The f*ck happened in this game? Chargers D decided to not show up. 0 pass rush. Special Teams coverage keeps giving up yards. Chargers had to travel across three time zones and play a game at 10am for the second week in a row. Schedule makers set them up to fail and it caught up to them, along with the Pats having an extra week off. Does anyone know the justification of making a West coast team play the early game while the late game is two eastern teams? The only thing worse than the game is the commentary.